The year was 1962. A brand new building arrived at Phoenix’s fledgling Sky Harbor Airport: its second terminal building. 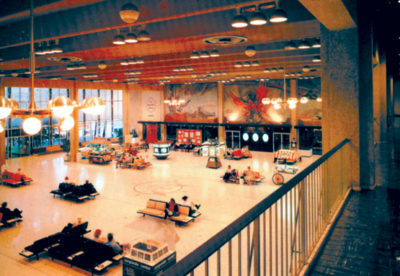 The building was made for jets — the old Terminal 1 (opened 10 years previously but demolished in 1991) saw the golden age of propeller aviation. Toward its end, Terminal 1 was home to Southwest Airlines before they moved into the just recently opened Barry M. Goldwater Terminal 4 at the east end of the airport campus. Fast forward just over half a century from Terminal 2’s opening in 1962 to 2013. The airport is now a regional hub for two major airlines – Southwest Airlines and U.S. Airways – and ha nonstop international service to cities in Canada, Mexico, Costa Rica, and the United Kingdom. But Terminal 2, at 51 years old, still plays its part in Phoenix aviation. Walking in to Terminal 2 is a different experience than its more modern — and more austere — counterparts. At the west end of the terminal headhouse building (now over the security checkpoints) is a mural by the late French-American artist Paul Coze. “The Phoenix” is one of Phoenix’s best midcentury murals and the phoenix bird is also replicated in his sculpture outside the Town and Country shopping center at 20th St and Camelback. In 2000, artwork from Terminal 3 was also placed in the Terminal 2 headhouse – a series of two paintings by the Western artist Billy Schenck and a 3D copper piece by Jose Bermudez. I’m here to say this: The demise of Terminal 2 is greatly exaggerated. While it will certainly close in the wake of Terminal 3’s westward expansion, the headhouse — the building with midcentury charm, the Paul Coze mural, and 51 years of history — will not be demolished. I have had conversations with high-ranking airport officials as well as those who work at Sky Harbor’s Airport Museum, the largest airport museum in the country and one of the largest in the world. Even if the building was slated for demolition, there is a great team (including myself) in place to protect, preserve, and conserve all of artwork that is in Terminal 2. The rumors on the street, while completely unofficial, are that the terminal headhouse will be converted into offices. As we go forward, we need to get the facts straight and our stories correct. Nostalgia is an important part of place, placemaking, and propinquity: Terminal 2 is one of those wonderful structures in Phoenix’s history as well as in aviation history. But we need to be mindful that there are systems, teams, and people working on protecting the Paul Coze mural as well as the other portable art works in that building. Nobody wants to see those works damaged or destroyed. It is necessary that we do not let our guard down. In addition to the artwork in Terminal 2, there are spectacular pieces of non-portable art in Terminal 3. 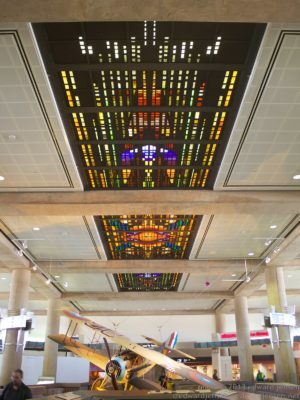 I am thinking of the award-winning terrazzo floor by the baggage claim carousels designed by Teresa Villegas or the stained glass that is above the main escalator well (look above the hanging airplane!) designed by Ken Toney in collaboration with the architects (see picture at right). But again, I am confident in the team that has been assembled in the preservation and protection of these works of art. A great city doesn’t need great art, it requires great art. So, too, does an airport: A great airport requires great art. It’s great that Sky Harbor has some of the best airport art out there.